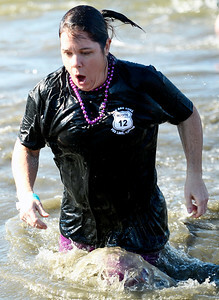 Kayla Wolf - For Shaw Media A member of the Route 12 Pub and Grill plunge group runs out of the water Sunday, Feb. 26, 2017, at the 10th annual Polar Plunge. 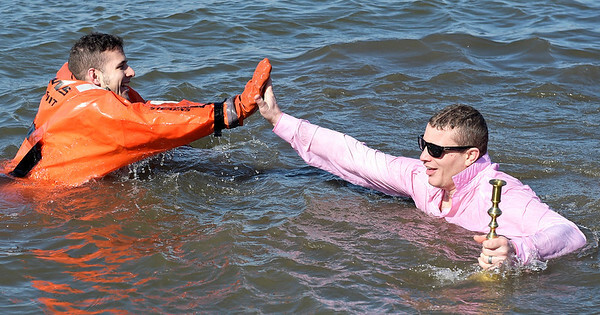 Kayla Wolf - For Shaw Media A member of the Fox Lake Police Department, right, high-fives Sam Santiago of the Fox Lake Fire Department, at the 10th annual Polar Plunge in Fox Lake Sunday Feb. 26, 2017. The Polar Plunge is a fundraiser the Special Olympics of Illinois. 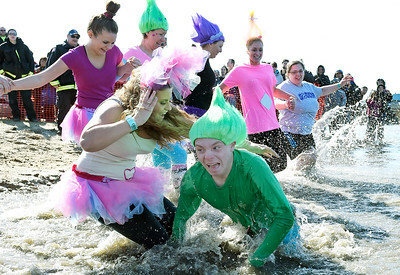 Kayla Wolf - For Shaw Media Members of the Woodstock D200 Trolls jump into Fox Lake Sunday, Feb. 26, 2017, for the 10th annual Polar Plunge in Fox Lake. Five schools participated in the 2017 Law Enforcement Torch Run Polar Plunge. 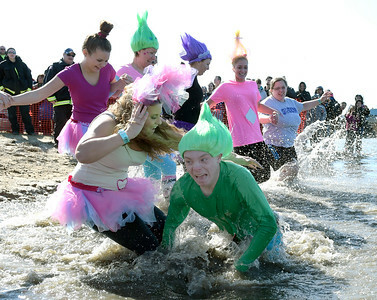 Kayla Wolf - For Shaw Media Members of the Woodstock D200 Trolls jump into Fox Lake Sunday, Feb. 26, 2017, for the10th annual Polar Plunge. Kayla Wolf - For Shaw Media Members of the McHenry Police Department run out of the water Sunday, Feb. 26, 2017 at the 10th annual Polar Plunge in Fox Lake to benefit the Special Olympics of Illinois. 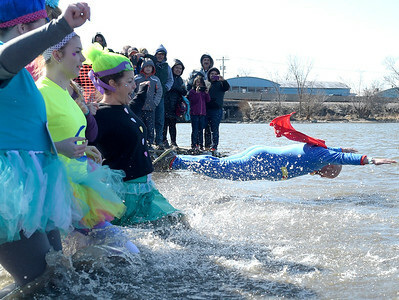 This year Illinois held polar plunges at 22 locations around the state. Kayla Wolf - For Shaw Media Tina Bree of Star 105.5 morning show slowly walks into Fox Lake in high heels Sunday, Feb. 26, 2017 at the 10th annual Polar Plunge. Star 105.5 emceed the polar plunge and costume competition. 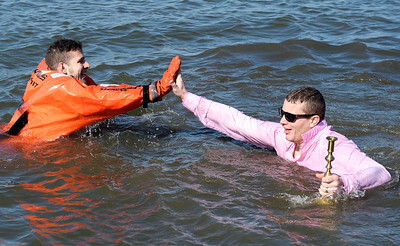 Kayla Wolf - For Shaw Media A member of the Fox Lake Police Department, right, high-fives Sam Santiago of the Fox Lake Fire Department, left, at the 10th annual Polar Plunge in Fox Lake Sunday Feb. 26, 2017. 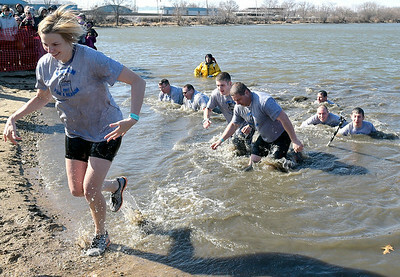 The polar plunge is a fundraiser the Special Olympics of Illinois. A member of the Route 12 Pub and Grill plunge group runs out of the water Sunday, Feb. 26, 2017, at the 10th annual Polar Plunge.